The charming Rose Cottage is a warm, inviting home on a small country road & surrounded by 40 acres of forest & horse grazing meadows. Surprisingly just 2 miles from I-26 w/only 15 minutes to Asheville & 10 minutes to downtown Hendersonville, this 1 level home is quiet, private & in an enchanted world of its own. Recommended for families! Babies, children and pets (dogs) are welcome! ENJOY THE FABULOUS AMENITIES: Powerful hot tub for 6, swimming pool 24’ x 4’, awesome massage chair, 55” HDTV/DVD, DVD library, master suite with king bed & sumptuous linens, full kitchen w/quality cookware, children’s playroom & outside playground, gas log fireplace, high speed wireless Internet, decks w/chairs/tables/umbrellas, fire pit & lawn area to play. With all the special touches, it feels like a warm, inviting home rather than a vacation rental house. I am a local owner who takes exquisite care of my homes and you! Please check out my business at Asheville Vacation Homes for more details about my 11 vacation homes. I have been renting to Asheville travelers for over 14 years and am so grateful for my satisfied guests and great reviews. YOU are my full time business and will do my best to see that you have a 5 star stay! - If dogs: # of dogs, breed, age, weight. - Where are you traveling from? - Anything else you would like to share – thanks! The inviting cabin feel of the LIVING ROOM with stone gas log fireplace, rich pine floors, 3 comfortable sofas (1 is queen sleeper) & attractive furnishings will embrace you in its warm ambiance. Enjoy the awesome massage chair, 55 inch HDTV with DVD, DVD movies, & Play Station w/games. There is high speed Internet wireless connection & phones w/free long distance so you can stay in touch! The delightful eat-in KITCHEN will charm you its quaint country cupboards, terra cotta tile floors & comfortable dining chairs. The colorfully festive dinnerware will make you smile & the top quality cookware will please any chef! This cook’s kitchen is set up with everything you need for preparing meals at home. The knives are sharp, there’s a multitude of quality cookware, coffeemaker & even a coffee grinder for your freshly brewed coffee. There’s an assortment of basic spices & plenty of storage space for your groceries. The quietly elegant MASTER KING SUITE will embrace you in rich restful comfort. Feel pampered by the ultra plush King Bed with sumptuous bedding & gorgeous headboard, beautiful marble tables & dresser with exquisite mirror, lovely décor, tiled floors & area rugs, & a romantic love seat for relaxing & watching your TV/DVD. The generous windows with view of the lovely grounds offer plenty of natural light. In addition, this generous-size suite offers a large walk-in closet & private bathroom with a gorgeous tile shower. The GUEST BEDROOMS have rich pine floors, plush queen beds, soft sheets, cloud soft blankets & elegant comforters. The beautiful décor in these rooms are pleasing to the eye & spirit. You’ll sleep well here! There is a queen sleeper sofa in the living room, twin bed in kid's area and as well as a twin air bed. The 2nd bathroom is done in rich color tones with tile shower/bath combination & ample number of fluffy towels. There is plenty of hot water with 2 new 50 gallon water heaters & new plumbing throughout! Kids love the play area filled w/stuffed animals, books & games, soft blankies & twin bed w/a super soft comforter. For babies, we have a sturdy oak crib & bedding, Play-N-Pack, baby bath tub, sturdy baby strollers, high chair and more! Outside is an extensive children’s playground w/swings, slide, fort, climbing wall, kids’ picnic table & a large level lawn area for running and playing. Roast marshmallows at the fire pit. You will be captivated with all private the outdoor space! Decks with plenty of tables & chairs, 6 person hot tub, above ground swimming pool that is 4 feet deep, The back of our cottage borders a 22 acre forest and the side yard borders a 14 acre meadow where you might meet our neighbor’s horses across the fence....they like to beg for apples & carrots from our guests! It’s hard to believe you are only 2 miles from the Interstate in this secluded enchanted oasis! YOU DESERVE TO BE SPOILED!!! With all the special touches, this is a warm inviting home rather than a “vacation rental house.” I promise you a meticulously clean & well-maintained home thoughtfully furnished with your every need in mind! I am a caring local owner who takes exquisite care of my 11 AshevilleVacationHomes properties and am available anytime to see to your needs. YOU are my full-time business! I am Stephanie Joy Johnson. My passion is creating beauty in real estate….remodeling and restoring homes, landscape design, interior home décor and, best of all, making guests feel pampered when they stay at my personally owned luxury vacation homes in the gorgeous mountains of Western North Carolina. I devote myself full-time to taking care of my homes & guests. YOU are my full-time business! My business is called Asheville Vacation Homes. I began this business in 2004 and delight in finding beautiful locations and gorgeous homes for vacation rental settings. I am always searching for interesting furnishings (shopping!) to add to the delightful decor for my guests. During your stay, you also might meet my awesome property manager and “fix-it man,” David. He can take care of any maintenance or property issues should they arise. He and I are both available 7-days-a-week to make sure your stay is the best ever! Email me for my web address to see all 10 of my vacation homes. Take a virtual tour at AshevilleVacationHomes. INDULGE! You deserve to be spoiled at my vacation home! I am a caring local owner and answer all inquiries personally. WHY THIS PROPERTY: I am passionate about living in these awesome Blue Ridge Mountains of Western North Carolina and adore sharing my vacation rental homes with guests who come to experience our area’s mountains & towns. I take exquisite care of my properties and am available anytime to see to your needs. I make sure each home is exceptionally clean, meticulously well-maintained and the hot tub sparkling with fresh water. I have lived in Asheville, North Carolina for many years and find great joy in discovering more and more reasons why this is the BEST PLACE IN THE WORLD TO LIVE! Asheville is consistently in the “Top 10 Places To Live” according to almost any criterion published! It’s a diverse multi-cultural blend of mountain folk and cosmopolitan society set in a dramatically beautiful mountain setting. It is my heart-felt desire to provide gorgeous welcoming homes in spectacular settings and to share this town with you! With all the special touches, I promise you that my vacation rental homes will feel as though you are staying at a friend’s warm inviting home rather than a 'vacation rental house.' You'll appreciate the tasteful decor and thoughtful care my homes reflect. Each home has been lovingly remodeled, elegantly furnished, beautifully decorated and thoughtfully accessorized with special amenities to pamper you including massage chairs, hot tubs, high speed wireless Internet, king beds with sumptuous bedding, HDTV’s & DVD's, movie libraries, quality well-equipped kitchens, fireplaces, central heat & air conditioning, washers & dryers and much more! Unique to my homes are all the amenities offered for babies and children. There are cribs, pack-n-plays, strollers, high chairs, baby bath tubs, stuffed animals & blankies. Older children love to play on the outdoor playgrounds with forts, slides, swings, climbing walls, etc. plus games, books, toys, kids DVD movies and more. Kids of all ages love to roast marshmallow at the firepits. My homes are easily accessed, right in-town, close to grocery stores, restaurants and shopping. No winding mountain roads to get lost in or long drives to town. The homes are in peaceful, lush vacation spots where you can relax and feel at home. Rather than dealing with a third party management company with limited business hours & knowledge of a home, you can deal directly with me, the owner. I am available to you 7 days-a-week, anytime between 9 AM and 7 PM and after hours for emergencies. I know my properties intimately because I have personally had them restored, remodeled, furnished and equipped. YOU are my full time business! Because I live locally, I am available whenever you call. Email me for my web address to see all 10 of my vacation homes. Take a virtual tour at AshevilleVacationHomes. toilet, shower, All new beautiful tiled shower. toilet, combination tub/shower, Plenty of quality fluffy towels! Our bathrooms are spotlessly clean! We have new plumbing through the home and two 50 gallon water heaters for plenty of hot water! There are ample soft fluffy towels for everyone. The home is at 2200 feet above sea level in a mountain valley of the Blue Ridge Mountains. The home is just 5 miles to Hendersonville's historic Main Street with 10 blocks plus side streets of wonderful restaurants, galleries, antique stores and unique shops. The back yard looks at 22 acres of forest and the side yard is a 14 acre meadow for horse grazing. Quality sumptuous bedding in all bedrooms: 400+ count sheets, butter-soft blankets, plush comforters & plenty of pillows. Plenty of soft towels for everyone! Plenty of bath towels, hand towels and wash clothes for everyone! We check to make sure the high speed WiFi is working before each group's arrival to insure connection! Delightful cottage style living room is warm & inviting....3 sofas (1 is queen sleeper), massage chair, 55 inch HDTV/DVD & lots of DVD movies. Fully equipped kitchen! Pretty handpainted plates, cups, glasses, cutlery and more. Delightful eat-in country kitchen & plenty of quality cookware & dishes! Lots of children & adult board games; Play badmitten outside where net is set up. There is a large DVD movie library for your entertainment. (2) 1st deck with tables, chairs & umbrellas, gated 2nd deck with hot tub and pool access. 24 foot x 51inches above ground pool with easy access stairs & handrail. There are child safety gates around the area. Very private, powerful 6 person hot tub with 53 jets & 3 motors! Child safety gates around the area. My husband and I stayed in mid April at this lovely, quiet home. Birds singing woke us every morning, the home was spacious, clean and comfortable. Located central to so many interesting places to visit too. 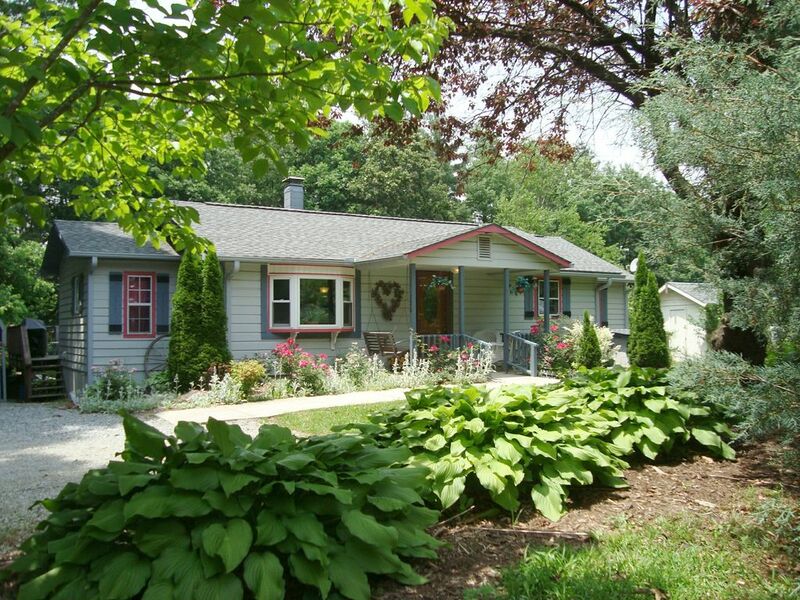 Rose cottage is a centrally located hidden gem. It is perfect if you have children. Lots of amenities on site. Everything was clean and great communication prior to arrival. Would recommend to anyone. Thank you for your review!! Glad you enjoyed your stay. We hope you return to our Asheville/Hendersonville and stay with us again. Everything we needed and more. Our family, including twin 2-year-old's and 2 dogs, stayed at Rose Cottage. The space in Rose Cottage is deceiving from the photo online. It had everything we needed to entertain the twins and our selves. Everything was clean, orderly, and labeled including light switches! The fire pit was a warm gathering place on a cool October evening. The massage chair was a necessity after 3 days with the twins. My family and I loved our stay at the Rose Cottage! The home is beautiful and clean, with all the amenities you could need or want. The kitchen is well stocked with all the basics and then some. We decided to make waffles for breakfast on the spur of the moment because the ingredients we needed were in the cupboards, along with a waffle iron! The weather was cold so we did not get the chance to go in the pool but the hot tub and fireplace were delightful! My daughter loved feeding the neighbor’s horses and playing in the backyard “clubhouse.” The bedrooms are spacious and beautifully decorated and we all enjoyed a great night’s sleep on the comfortable beds. Stephanie was prompt in responding to my emails and went above and beyond the minimum to accommodate our requests. We would definitely stay at the Rose Cottage again and highly recommend it to anyone looking for a great place to stay! The Rose Cottage rental was exactly as advertised and pictured. The home was very clean and contained everything thing that you would need for your stay. The location was central to highway 26 and all Asheville activities. Everything in the home worked exactly as it should. Thank you for your attention to detail. Great home for vacation. Neat, clean and pampered. House, pool and hot tub were very nice. Enjoyed our stay. Stephanie goes above and beyond to make her guests comfortable. The surrounding area is great for hiking...we even saw a black bear! Biltmore is beautiful and the Chihuly exibit is incredible....view at dusk/dark. A must see is the 250 room Biltmore House. If you love to shop, there are fantastic antique stores, numerous galleries, unique boutique shops, & amazing hand-crafted goods. This region is host to numerous festivals filled with music, dance, arts & crafts. There are family events, concerts, cinemas and museums. For golfers, there are numerous courses. There is skiing, white water rafting, you name it! Check out the new Fun Depot for a wealth of indoor fun. Sightseeing along the Blue Ridge Parkway is outstanding with many hiking trails & waterfalls along the way, These ancient Appalachian Mountains is home to mountain music & dancing. Several times a week you can test your dancing shoes at Contra Dancing with live upbeat Celtic music. Guests may purchase BILTMORE ESTATE TICKETS AVAILABLE AT DISCOUNTED PRICES GOOD FOR 2 CONSECUTIVE DAYS INSTEAD OF JUST ONE! Children ages 9 & under are FREE at the Biltmore. The upscale BROADMOOR GOLF LINKS located in the lush French Broad River Basin is a certified Audubon Society award winning 18-hole Par 72, 7000 yards golf course known for its bent grass greens & practice facility. You will encounter ponds, streams, views & abundant wildlife. The ORCHARD TRACE GOLF CULB is an 18 hole par-3 course w/2,139 yards of golf from the longest tee. It has a course rating of 54 & a slope rating of 113. It’s perfect for a quick 18 hole game & reasonable green fees. Night golf is a great treat! The CUMMNINS COVE GOLF is an 18 hole par 71 course w/long-range vistas of the Blue Ridge Mountains at this 3,000’ elevation. Fairways are lined w/trees, lakes, streams, waterfalls & spectacular mountain views! From the longest tee, there are 6,415 yards of golf. The course rating is 70.1 & a slope rating of 129 on Bermuda grass.